[1:14] <Otyugh> so out of memory : video memory or "central memory" that wasn't used at all ? [1:14] <Otyugh> isn't that a omxplayer bug ? [1:27] <shiftplusone> Otyugh, the pi synchronises fine here, you'd need to figure out why it fails for you. [1:28] * shiftplusone pours out the coffee and replaces with tea. [1:28] <ShorTie> even better, lol. [1:35] <pyb0k3h> but what are pins SDA and SCL?? [1:36] <pyb0k3h> so can i use the code at adafruit to display a message with this current setup? [1:36] <shiftplusone> just make sure that the pins aren't pulled up to 5V on the board. [1:37] <shiftplusone> where did you get the board? [1:39] <shiftplusone> see how you go with adafruit code and hope it doesn't fry your pi then. [1:42] <gaz_b> hi there, can anyone reccommend a 128GB SD card i can use in a revision B board running raspBMC ? [1:42] <shiftplusone> gaz_b, bad idea. SD cards aren't made to last or be reliable. [1:43] <gaz_b> does that go for USB sticks too ? [1:44] <gaz_b> i want to store files locally on my media centre (not stream) , would a 128GB USB stick be better? [1:44] <pyb0k3h> shiftplusone: so you're saying i should use that LCDPlate libary instead? [1:45] <shiftplusone> pyb0k3h, I am not saying either. I am just pointing to the i2c version of the library, but it seems to also use the io expander chip and might require modification. I haven't looked into the specifics. [1:46] <shiftplusone> gaz_b, a hard drive with an external power supply would be ideal. [1:47] <shiftplusone> pyb0k3h, there are some problems with doing that. [1:47] <pyb0k3h> doing what? removing the board? [1:47] <gaz_b> mmm, that would moving away from the prtability i need .. ideally a 128GB stick to store files. Ideally ill want to power even the raspberry pi from the USB power from the TV usb ports... ideall no power socket at all .. is taht psosble ? [1:47] <shiftplusone> the controller is designed for 5v. Although it will work with 3v, you will have contrast issues. [1:48] <shiftplusone> If it operates from 3v, the contrast needs to be a negative voltage. [1:49] <blair449> hello, how can I change the boot of raspbian so that it doesn't load unnecessary services? [1:49] <shiftplusone> The 'right' way to do things is to read the 'busy flag' before sending a command ot make sure it's done with the last one, but what most people do is just wait a little bit after sending the command. That way is a little slower, but works. [1:51] <blair449> what is that shiftplusone? [1:59] <gaz_b> will running a 128GB USD stick require any more power than is required as standard by the Pi? [2:01] <gaz_b> i guess what i mean is ..is a 128GB USB stick a power hungry device ? [2:02] <gaz_b> will it power from a TV's USB port ? [2:02] <gaz_b> TV's have different USB 2.0 power output ratings ? [2:09] <gaz_b> somebody mentioned i will need to buy a codec licence from raspberry pi to play certain file types aswell ..is this true ? [2:10] <shiftplusone> the codec prices aren't bundled into the cost of the hardware as they are with most other devices. [2:19] <shiftplusone> what do you mean by open and close? [2:22] <shiftplusone> So I guess it uses the kernel module then. [2:30] <kevireilly> am i remembering wrong or do some switches have 2 or 3 connectors? [2:31] <shiftplusone> SPDT (single pole, double throw) would have three contacts, for example. [2:32] <shiftplusone> is it a button or a switch? [2:41] <shiftplusone> or in some cases, nohup might be enough. [2:42] <ebswift> is that from the client end or on the raspi? [2:43] <ebswift> uh, though 'screen' is a little too generic for google, is there a link or a more specific search term? [2:46] <ebswift> this is all at the console right, not in x? [2:46] <shiftplusone> ctrl+a, c will create another window. you can press ctrl+a, 0-9 to switch between windows. [2:47] <ebswift> can multiple clients connect to the same screen? [3:11] <maximum_deletion> anyone using ROS on their rPi? [3:49] <pyb0k3h> seems to work except that the message/text doesn't appear! [3:52] <shiftplusone> the adafruit plate uses an io expander chip, so their code is to control that. And I think your backpack has a microcontroller which passes i2c commands to the LCD. I don't think the library is usable. Although I still think using i2c is easier, if you don't know the controller and you haven't worked with i2c, it may be easier for you to remove the backpack. [3:53] <shiftplusone> tried adjusting contrast? [3:54] <pyb0k3h> also why is it that i had to set addr=0x27 and not 7x27 like my i2cdetect shows? [3:55] <shiftplusone> I don't know, i've only used SPI. Haven't touched i2c yet. [3:58] <pyb0k3h> so if "27" appears in the 7th column and row labelled "20", my address is 7x27, right? [3:58] <ldunn> I think your address is 0x27 in that case. "0x" is notation that means "this number is in hexadecimal"
[5:34] <skiddex> can anyone help? i cannot ssh to rpi over wan but ssh over lan works fine. also xrdp works fine both on wan and lan. [7:41] <Taylor> http://www.raspberrypi.org/forum/viewtopic.php?f=28&t=68029 - if anyone could look at the last post and possibly point me in the right direction, I'm not even sure what to debug at this point. I thought for sure it was a hardware issue but after replacing all hardware I'm still having issues. [12:03] <ShorTie> are you sure that +5 goes to jd-vcc and not the vcc right next to it ?? [12:04] <ShorTie> you got ohm meter maybe ?? [12:08] <basti> no you dont have that. allready checked this. you can use a jumper to bridge jd-vcc and vcc, when you want to only use 5v. [12:15] <ShorTie> your +5 has 2 wires ?? [12:19] <ShorTie> got a couple aa batteries ?? [12:23] <basti> sure, you need a common ground. else it would not work.... and of course, the relais itself does work fine. [12:26] <basti> you are right. [12:29] <basti> but that does not explain, why i fried the pin, does it? [12:57] <local> hey all. In /var/log/syslog I get messages with words like "DBUS activating org.freedesktop.policyblablabla" and so on. That is confusing me. I have configured "raspi-config" to boot into console, and therefore I am not using X or any desktop. Do I really need DBUS, is that default behaviour on a RPi ? [13:04] <ShorTie> D-Bus is an inter-process communication (IPC) system for software applications to communicate with one another. [14:31] <local> ShorTie: ok, I know about DBUS but I just compared to all my other RPi's. They don't show such log entries and that's why I am wondering about. Why does this particular RPi try to load freedesktop.org.xxxxxx ? [16:59] <basti> http://yourduino.com/p/OptoRelayChannelData-575.jpg as explained earlier, JD-VCC is powered by an external source (5V). IN0 to some gpio and vcc 3.3V from the pi. [17:01] <shiftplusone> and you've got the optocoupler in there? [17:01] <shiftplusone> a little overdone, but I don't see anything that can possibly harm the pi if it's wired up correctly. [17:03] <shiftplusone> wouldn't kill your pi, but the pi's ground is connected to the external supply's ground? [17:04] <shiftplusone> actually, in that circuit it doesn't matter, nevermind. [17:04] <basti> yeah, ShorTie pointed that out earlier, too. [17:04] <gordonDrogon> basti, what is Vcc connected to on the input side? [17:04] <gordonDrogon> are you sure it's 3.3v? 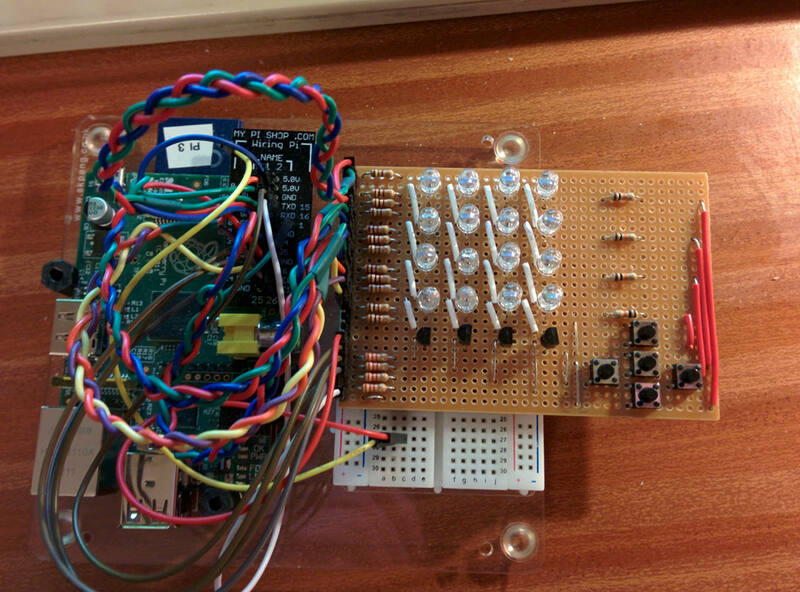 [17:05] <gordonDrogon> then it's virtually impossible to "blow" a gpio pin that way. [17:07] <gordonDrogon> have you run pintest? [17:08] <basti> where was that again? [17:13] <gordonDrogon> that indicates that the pins work OK in INPUT mode and that the internal pull-up/pull-down resistors are working correctly. [17:14] <gordonDrogon> the only way to test output mode is to connect a pin to a 220Ω resistor and then to an LED. [17:15] <gordonDrogon> sure you're measuring the right pin? [17:15] <gordonDrogon> pin5 - assuming this is header pin 5 - that's one of the I2C pins. [17:15] <gordonDrogon> it's pulled high to 3.3v via a 1800Ω resistor. [17:17] <gordonDrogon> but it drives high or low, so shouldn't matter. [17:17] <gordonDrogon> well - I guess it's possible the output driver is blown - I've not seen that before. [17:17] <gordonDrogon> however there are 2 output drivers - one to drive it high, the other to drive it low. [17:19] <gordonDrogon> I do find it hard to work out how connecting it to the opto isolator would blow the pin though. [17:19] <gordonDrogon> unless you mis-wired and connected it to the +5v line directly. [17:32] <AndreeeCZ> hello guys. Could someone point me to how can i send bytes to uart? [17:36] <basti> gordonDrogon, i have some pis that dont need gpio, so i could do that... just so you believe me. [17:41] <shiftplusone> got, your work? [17:52] <AndreeeCZ> gordonDrogon, would this send one byte? [17:54] <fatalfuuu> http://www.ebay.co.uk/itm/221310796237 anything obvious to make this not good? [17:56] <gordonDrogon> AndreeeCZ, you probably need to write a program to do it efficiently. [17:59] <gordonDrogon> fatalfuuu, how many motors do you need to control? [17:59] <gordonDrogon> ok - well that'll do it. [18:49] <AbbyTheRat> hmm, it's possible to connect up two displays to the GPIO? [18:50] <shiftplusone> I don't see why not. 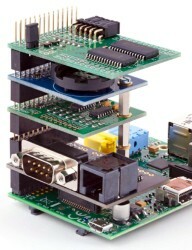 [18:57] <AbbyTheRat> https://www.modmypi.com/raspberry-pi-expansion-boards/pi-rack Encrypt, this is what you're thinking of? [19:08] <iiie> Encrypt: like http://www.instructables.com/id/Led-Cube-8x8x8/step8/IO-port-expansion-more-multiplexing/ ? [19:10] <Encrypt> I got it! [19:13] <iiie> AbbyTheRat: how many IO pins do you need for each display? [19:20] <gordonDrogon> AbbyTheRat, LCD type displays? You can connect a dozen or so. [19:24] <gordonDrogon> won't quite make a big cube though. [19:24] <gordonDrogon> you can do a 4x4x4 on a Rev 2 Pi though if you use the P5 GPIO connector. [19:25] <gordonDrogon> my 48 LEds are a 4x4 by RGB array. [19:25] <gordonDrogon> all done via multiplexing. [19:31] <rigid> gordonDrogon: it's a nice abstraction framework. it's easy. you can easily send pixels to it using VLC, gStreamer, SDL, netcat, etc. [19:36] <gordonDrogon> I hardly think a 4x4 array is worth it..
[19:36] <gordonDrogon> and I've already written the software to drive it. [19:37] <gordonDrogon> and to be honest, I doubt anyone will built it - it's part of a project, but my fear is that people have just lost the ability to put together some stripboard. [19:48] <rigid> gordonDrogon: is it stackable? so you could append another 48 LEDs? [19:48] <rigid> in what language is your driver software written? [19:49] <gordonDrogon> rigid, Heh.. not stackable no. it's all in C using wiringPi. [19:50] <gordonDrogon> maybe, but what's the point. that's the only one - there will never be more. [19:50] <gordonDrogon> I already use it with high level software. C and BASIC. [19:51] <rigid> that's not high level. how do you generate the pixels? [19:52] <gordonDrogon> I have no use for that. [19:53] <gordonDrogon> that board relies on wiringPi. it's designed to work on a Pi. [19:55] <gordonDrogon> I know what you're getting at, but my tetris game is written in BASIC and runs under my own BASIC interperter on the Pi. [19:55] <gordonDrogon> 4x4 isn't big enough for tetris. [19:56] <gordonDrogon> basically, I have no interest in putting another layer of software between what I want to do and the hardware. much as it might make it easier for others, there are no others here. [19:57] <rigid> are you doing PWM with this setup? [19:57] <gordonDrogon> no. it's not easilly possible with that setup. [19:57] <gordonDrogon> so each LED is only 8 colours. [19:57] <rigid> well, if you do a lot of LED stuff, you appreciate the additional layer. It saves lots of time. And also simplifies hardware. [19:57] <gordonDrogon> I don't do a lot of LED stuff. [19:57] <gordonDrogon> that's the most complex. [20:00] <gordonDrogon> rigid, part of the "issue" is that I already have my own very nice library for drawing stuff into a 'framebuffer' it was utterly trivial for me to write the LED driver here then make my library use it. Essentially I have a 4x4 framebuffer that you poke pixels into and the appear on the LEDs. [20:00] <gordonDrogon> AbbyTheRat, maybe - but you'll need to work out how its interfaces. [20:01] <AbbyTheRat> how could I do that? [20:01] <gordonDrogon> find and read the fine manual. [20:04] <AbbyTheRat> missing a manuel, is there another way to find out the interface for it? [20:05] <AbbyTheRat> hmm, how do you mean interface? [20:05] <gordonDrogon> rigid, so instead of me calling plot(x,y,colour); I call niftyLedPlot(x,y,colour) ? [20:07] <gordonDrogon> Hm. discovered a bug in the sprite handling in FUZE BASIC - Heh - I guess I could jsut treat the screen as a 1920x1280 array of LED pixels then? [20:16] <AbbyTheRat> gordonDrogon: the interface - is that knowning what pin it is or something more then that? [20:23] <gordonDrogon> basti, have you tried trying to make it work without a Pi? ie. just use a 3.3v power uspply? [20:23] <gordonDrogon> basti, even just use the Pi's 3.3v supply - see if you can make the relays click..
[20:26] <gordonDrogon> basti, well you need to measure the current going through the opto isolators, but with a 1K resistor in the way it should be very low. [20:26] <gordonDrogon> basti, there is something very wrong if a simple resistor + opto isolator is "blowing" gpio pins. [20:27] <basti> gordonDrogon, as you can see in the photo, the wiring is correct. the pin was working fine beofre i wired it up. [20:28] <Taylor> is it safe to set up an image in qemu? when flashed to the pi will there be discrepancies/errors or can it boot flawlessly? [20:29] <gordonDrogon> basti, I'm at a loss here then. I do not know. [20:30] <basti> i will order a new relaisboard... but i would like to know what happende. anyone want the old one? [20:31] <shiftplusone> Why are people saying 'relais' nowadays? [20:31] <AbbyTheRat> so what could I do to find out what info I need to send? maybe I could wire the other board into something (the pi?) and record what information it's sending? [20:31] <shiftplusone> at first I thought it was some foreign language thing, but I have seen it too many times now. [20:32] <AbbyTheRat> shiftplusone: I'm guessing relays only for some reason thinks the purals should be is, instead of ys? [20:33] <shiftplusone> and French, apparently. [20:37] <AbbyTheRat> didn't the latest version of the pi had a 5v? [20:38] <IT_Sean> the GPIO on the raspi has always been 3.3v. It has always used a 5v PSU. [20:39] <shiftplusone> there is 5v on gpio, yes. [20:39] <AbbyTheRat> so, the 4v5 pin on the board maybe addressable? [20:41] <pksato> lcd? alarm clock? ? [20:41] <pksato> most alarm clock, calculator, etc, use a controller less LCDs. [20:42] <gordonDrogon> basti, no wories! [20:43] <pksato> dont know this type of display. [20:51] <pksato> AbbyTheRat: you need to figure out that controller used on this lcd module. [20:51] <AbbyTheRat> how would I do this? [20:54] <pksato> appears to be a serial data communication. have a clock and data lines. [20:54] <pksato> clock still work? [20:56] <pksato> need todo a reverse engineering, use RPi as data analizer. [20:57] <AbbyTheRat> so plug into the clock side? I was told that the board ouput v5 address or something like that.. so I would need to use resisters? [20:59] <AbbyTheRat> on each output? [21:00] <pksato> yes, on all data lines of clock. dont need to connect a vcc. [21:01] <pksato> image is out of focus to read lebels. [21:01] <pksato> vcc, vdd are power lines. [21:03] <pksato> data, sck and stb need to sniffed. [21:03] <gbaman> what does a user need access to to work with GPIO? Without root? [21:04] <gordonDrogon> without root - you need something that will open the /sys/class stuff for you and change the ownership, then you use the (slow) /sys/class interface. [21:04] <gordonDrogon> but you still need root to do that. [21:04] <gordonDrogon> alternatively you make your program set-uid root. [21:05] <gordonDrogon> but you can use the gpio program to do all the exports for you in /sys/class before you start your program. [21:05] <gordonDrogon> so a shell-script with e.g. gpio export 17 in, etc. in it. [21:05] <AbbyTheRat> okie, thanks, pstato. [21:06] <J-e-f-f-A> Hi. I'm building a call screener/blocker and have run into a snag - when I play audio files (wavs) with aplay to the analog 3.5" jack, the pi often hard locks and I have to power-cycle it. I thought I read of fixes going into the kernel months ago, but I'm running the latest everything and still having issues. [21:06] <J-e-f-f-A> Could I work around that by using a USB sound card? 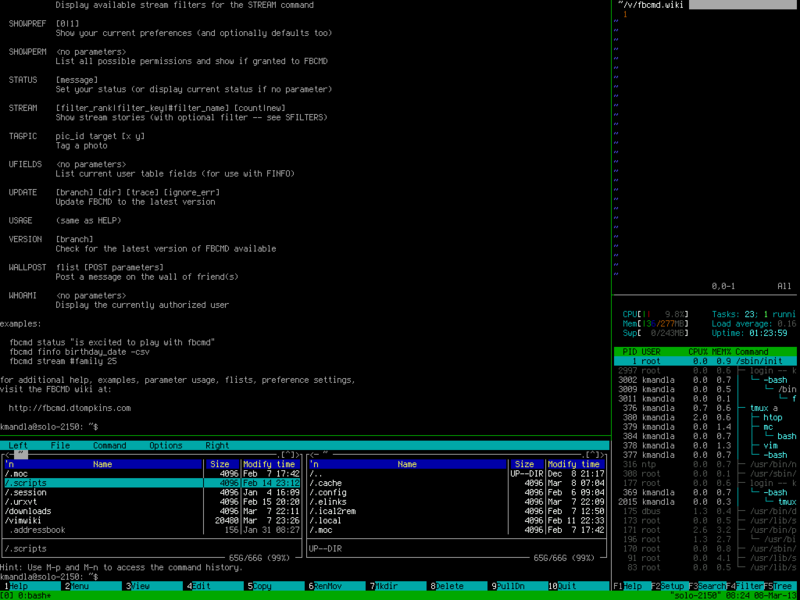 [21:07] <J-e-f-f-A> Oh, and It's a v2 pi running raspibian. [21:13] <basti> can you swap an installed os from one pi to another without running into problems? [21:13] <J-e-f-f-A> AbbyTheRat: That looks like a cool LCD. If the clock is still operational, I'd 'sniff' the data pins as others have suggested. - Maybe while in a 'time set' mode while you move the minutes forward/backwards, etc - to view the commands. [21:14] <J-e-f-f-A> basti: I've done it between v2 machines fine - not sure if there's anything to be concerned when going between v1 and v2 though. [21:15] <AbbyTheRat> could do the whole thing blind so it's no problem. [21:15] <J-e-f-f-A> AbbyTheRat: If you were blind, I don't think an LCD would do you much good. LOL! [21:16] <AbbyTheRat> I mean I could get all the info I need without needing to see the LCD display. [21:16] <J-e-f-f-A> Ah, so it wouldn't do any good to YELL at you. [21:18] <J-e-f-f-A> AbbyTheRat: Anyways - if you re-connect that display to the clock, then sniff the lines to reverse-engineer the protocol to control it. [21:20] <AbbyTheRat> sniff? so instead of plugging the pi in directly? so more like clock - |pi - LC Display? [21:20] <J-e-f-f-A> AbbyTheRat: And/or - trace those signals back to the chip that's driving them - if you get lucky, it would be a standard microcontroller and perhaps the I2c or SPI pins. Who knows. [21:21] <J-e-f-f-A> Well- connect to the clock, and 'sniff' the pins with an o-scope or logic analizer or a program on the pi written to read the pins and 'record' them for your analysis. [21:24] <J-e-f-f-A> So I've got my CallerID Logger/Blocker running on one of my PIs, but if I try to play an audio file it hard freezes often... Googles seem to suggest that there -was- a kernel panic issue, but has since been fixed. [21:24] <J-e-f-f-A> My Q is if a) It's still an issue, and if anyone knows a fix for it, and/or B) Will using a USB Sound Card work around the issue? [21:24] <AbbyTheRat> huh.. almost sounds like you hit a different issue? a corner case? [21:27] <J-e-f-f-A> I suppose I could also try another OS - I'm using Raspibian right now. [21:27] <basti> i dont know if these things do anything, but you could try usbee ax pro. [21:28] <AbbyTheRat> oh huh, sounds like a VoIP Raspberry Pi? [21:28] <J-e-f-f-A> AbbyTheRat: Not quite - actually interfacing to an Analog line. My 92yo grandmother has been getting scammed by people in foreign countries - I've got about 98% of the calls blocked/stopped now, but some still get through. [21:30] <pksato> J-e-f-f-A: play sound with out hang if disconnected from any other device? [21:40] <AbbyTheRat> worth a try? [21:40] <AbbyTheRat> but I agree with you on that front. [21:42] <J-e-f-f-A> Yeah, I'll try when I get home. I'll also try another v2 Pi with that SD card to see if perhaps there's a hardware issue with the PI itself in regards to Audio playback. - Sometimes it locks up, sometimes it doesn't... On the surface it seems like an interrupt issue to me. [21:43] <J-e-f-f-A> I'm assuming if it's an overall audio issue with the PI itself, then using a different program to play the wav file won't make any difference either. The google hits I found referenced 'mixing' sounds. [21:45] <Topcat> how do you 'start on boot' in script copied to init.d/myscript I must be missing a register step. it wants files to exist in /var/run do I always have to make these in my init script ? [21:47] <uriah> does anyone know what options are needed in kernel configuration in order to get gpio pins in /sys/class/gpio ? [22:00] <AbbyTheRat> J-e-f-f-A: wouldn't know, I'm too new to understand. [22:06] <basti> ShorTie, interesting? why? [22:08] <AbbyTheRat> mhm, good idea.. wouldn't it be better just to force the callers to display their phone? or is it possible to proof Phone numbers? [22:09] <J-e-f-f-A> AbbyTheRat: Not enough - these guys are typically from Jamica, and either spoofing phone numbers or using VoIP devices such as MagicJack to call from US numbers. [22:10] <J-e-f-f-A> My grandmother's hearing is quite poor, and she can't hear their accents. And if the Answering machine picks up, 99.9% of the time they just hang up. [22:10] <J-e-f-f-A> So if I get a couple of hangups from the same number, i'll put it in my blacklist. [22:11] <J-e-f-f-A> AbbyTheRat: Yeah, there's a whitelist to let them through without any blocking. [22:13] <J-e-f-f-A> Thankfully I've come to the Pi after tinkering with microcontrollers and Arduinos, and Linux for the last ~10 years... And I've got an electronics and programming background, so learning the pi is coming pretty easily, even though I'm somewhat of an 'old fart'.lol! [22:13] <basti> but can someone else run that srcipt and nopaste the ouput? [22:24] <J-e-f-f-A> AbbyTheRat: Ah, so not totally deaf, just headed that way. gotcha. [22:28] <lorenzo> hi! do you think a BlackBerry 5V, 700mA power adapter will be fine? [22:29] <AbbyTheRat> shiftplusone: indeed, sounds like this would do great as a beat part? [22:29] <shiftplusone> lorenzo, should be fine. [22:30] <shiftplusone> AbbyTheRat, yeah, the high seem a bit too screechy. [22:32] <local> anyone can explain to me, why DBUS loads service "freedesktop.org.xxxxxx" on my RPi? All my other RPi's doesn't show such log entries within /var/log/syslog. But one RPi seems to load that stuff and I don't know why. I configured through "raspi-config" to use console only, no X ! [22:34] <AbbyTheRat> local: sure you didn't miss a step? [22:42] <[Saint]> I made my phone vibrate the little "shave and a haircut, two bits" jingle. [22:43] <[Saint]> I can control duration and intensity, I could make longer jingles but I have to do it all manually. No way I've found to convert it automagically. [22:43] <[Saint]> ...though, I could probably script it if I tried hard enough. I'm just astoundingly lazy. [22:44] <[Saint]> https://en.wikipedia.org/wiki/Shave_and_a_Haircut - if anyone is wondering. [22:46] <AbbyTheRat> that's freaking awesome! [22:47] <AbbyTheRat> [Saint]: look at what you could do if you weren't so lazy! [22:48] <[Saint]> Sadly, my raspberrypis are *very* unused presently. [22:48] <AbbyTheRat> and that music just sent EVERYTHING but the router off the top of my "woofer"
[22:48] <[Saint]> One of them is literally a paperweight. [22:48] <AbbyTheRat> shame on you! [22:49] <[Saint]> Its better in every fathomable way. [22:51] <[Saint]> I rant about it far too much in this channel. 1GHz dual core CPU, embedded NAND storage, actual dedicated ethernet that doesn't share a bus, GPS, thermometer for GPU, CPU and ambient, HDMI, composite video in and video out, composite audio in and out, a metric crap-tonne of other sensors...they're great. [22:51] <local> AbbyTheRat: what step? [22:51] <AbbyTheRat> local: I don't know, that's just my gut feeling. [22:52] <[Saint]> The best part is the failed miserably at launch and STE is getting rid of them at 1/6th the original price. [22:52] <[Saint]> $50 USD for the above. [22:55] <AbbyTheRat> so why are you in here? you're a heretic! [22:56] <[Saint]> In my experience you need to have a very low bar to not need to compromise in /some/ way with this hardware. [22:56] <[Saint]> Generally speaking a lot of people try to do way too much with them. [22:58] <[Saint]> local: sometimes it pays to pick your battles. [22:58] <[Saint]> If everything you want to do works, "meh". [22:59] <AbbyTheRat> try reconfiguring the raspberry pi? [23:00] <[Saint]> Bah. Dist upgrade kicked my off my core. [23:00] <[Saint]> Unfortunately the whole "my other pis don't do X" isn't /terribly/ useful, unless they have the *exact* same configuration. [23:01] <[Saint]> Which is doubtful. [23:09] <local> AbbyTheRat: are you kidding? [23:10] <[Saint]> Protip: When people try to help you - don't insult them. [23:10] <[Saint]> I understand you're frustrated. But, ...yeha. [23:10] <AbbyTheRat> so what, you copy/pasted config every time? [23:11] <[Saint]> The odds of all setups being identical is immensely low. [23:11] <[Saint]> Making comparison practically useless. [23:14] <local> AbbyTheRat: no! of course not! I don't copy paste the configs, but if you cannot help anyhow, why do you even reply? this is not what a user expect to get as a helping reply. [23:14] <[Saint]> There are people here with all ranges of skill. [23:14] <[Saint]> Either accept that, or move on. [23:15] <[Saint]> Don;t insult someone because they don;t know any more than you do. [23:15] <AbbyTheRat> I might not know exactly what's wrong, but I can at least help you to help yourself. [23:15] <[Saint]> I have watched the entire situation. You're being absolutely unreasonable. [23:16] <AbbyTheRat> [Saint]: what was it? 99% of the errors is between the keyboard and the chair? [23:17] <[Saint]> Please, take the attitude elsewhere. [23:18] <[Saint]> Be happy you got a response at all. [23:18] <[Saint]> And think how much this attitude inspires others to help you. [23:18] <[Saint]> ie. not at all. [23:19] <[Saint]> ...says the guy stuck debugging the same issue for days on end. [23:19] <[Saint]> Can we say irony? [23:22] <[Saint]> Lets not do that. SOmeone is bound to copy paste that. [23:23] <[Saint]> lorenzo: I expect shipping to be prohibitive unless you're in my neck of the woods. [23:23] <AbbyTheRat> [Saint]: where is your neck of the woods? [23:24] <[Saint]> I'm given to believe the foundation has shipped units to those in dire financial stife before now. [23:25] <local> time to get a life, too IMHO. Think about it AbbyTheRat. [23:26] <[Saint]> hahahah - yeah, that's not obvious at all. [23:26] <[Saint]> Nice try local. [23:31] <dwarder> is there a wake on lan feature? [23:33] <gordonDrogon> dwarder, you can power down the entire USB system if needed. [23:33] <[Saint]> dwarder: appropriate spindown times (possibly adjusted based on time of day) should solve that. [23:33] <[Saint]> I have a system to spin down very quickly at night, and almost never during the day. [23:33] <[Saint]> Works for me. [23:33] <dwarder> [Saint]: how can i configure this? [23:34] <[Saint]> possibly a better way. [23:35] <[Saint]> "hdparm -S <value> /path/to/disk"
[23:43] <[Saint]> I'm not entirely convinced that there isn;t a better way to do it, but it works for me. [23:44] <[Saint]> I have a bunch of D-Link and Linksys routers that Telecom NZ threw out after Snowden clued the world in on them all being backdoor'ed. [23:44] <J-e-f-f-A> lorenzo: PM me, and I'll try to find one... I threw out a bunch of old electronics when I lost my house though, so I may not have one anymore. [23:45] * [Saint] hopes J-e-f-f-A remembers where he parked the house. [23:46] <[Saint]> "I know its round here somewhere..."
[23:48] <[Saint]> Its possibly "racist", but, why do I immediately imagine that happening in the US? [23:50] <J-e-f-f-A> Bingo! The good-ole USA. [23:51] <J-e-f-f-A> So is it OK that I'm an American and using Raspberry Pis? ;-) lol! [23:53] <[Saint]> Right foot red. [23:54] <AbbyTheRat> and I have red hair? [23:55] <J-e-f-f-A> Oh, is that why my PI crashes when playing the wav files? IE: Because they are of an American English accent instead of a British English accent? eek! [23:58] <[Saint]> Well, really, /proper/ English is En-NZ. Says I. [23:58] <[Saint]> Being lord of all 'tis right and holy, and all. [23:59] <shiftplusone> the world would be a lot more hilarious then.